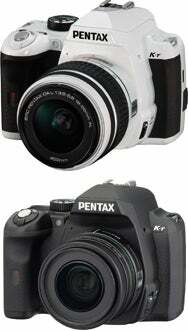 Pentax on Wednesday announced the new K-r, a successor to last year's well-received K-x mid-level DSLR. The K-r improves on the core features of the colorful K-x in a number of ways. It has a new 12.4 megapixel CMOS sensor optimized for low-light, 720p HD movie recording at 25 frames per second, in-body image stabilization, and 6 fps continuous burst shooting. There is also a bumped-up 11-point autofocus with a focus assist lamp. Taking a cue from the popularity of camera phone image editing apps, the K-r has added creative new in-camera effects. There are 18 digital filters such as Sketch, Starburst and Retro, that can be applied individually or stacked on top of each other for differing results. There are a few cross-processing effects with the option to have the camera choose one at random. The K-r also has a high dynamic range (HDR) function, which takes three images at different exposures and combines them into one photo. Even movies can use the filters, which are chosen before shooting or added later. The idea behind these fun, consumer-level add-ons is to encourage experimentation, and to give users pictures and movies that are ready for sharing without needing a trip to an editor. Low light shooters will be pleased with a native ISO range of 200 to 12800, a boost option that expands that range to 100 to 25600, and a new Night Scene HDR mode.The K-r sports a 3-inch LCD screen with VGA resolution and live view. The screen is in a fixed position, but it is a high-resolution 921,000 dot monitor (impressive for a camera of this class), which Pentax claims is viewable from about 170 degrees side-to-side or below and above. Being able to choose between two types of batteries is a welcome new option. The rechargeable battery allows approximately 560 shots, based on CIPA testing standards, and an optional battery holder allows four AA batteries to power the camera in a pinch. The K-r has an infrared data transmission system. IrSimple-compatible devices can act as a wireless conduit for sending pictures from the camera to the web. Two K-r cameras can also use IrSimple to play a simple match game comparing exposure settings. Given the limited number of devices that support IrSimple, this feature will probably be of little use to most consumers. Its predecessor, the K-x, came in a rainbow of colors but the K-r isn't making as bold of a statement, yet. It comes in matte black, glossy white with black accents, and glossy red with black accents. 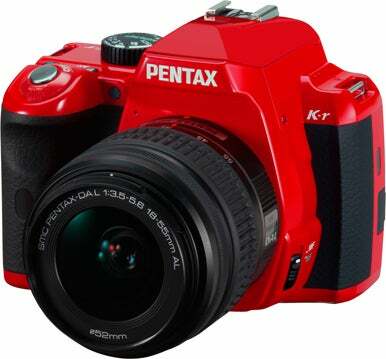 The K-r will ship October 2010 packaged with an 18-55mm lens (27-82mm equivalent) for an estimated $850. It will also be sold body-only for $800, in a double-lens kit with an additional 50-200 telephoto zoom lens for $900, or in a double-lens kit with an additional 55-300 lens for $1,000. 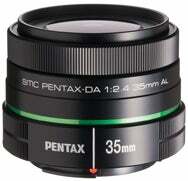 Pentax is also releasing a new smc Pentax DA 35mm F2.4 AL prime lens. This bright lens has a f/2.4 maximum aperture and is better than the kit lenses for capturing low-light images and creating shallow depth of field. The lens will also ship in October and sell for an estimated $220.